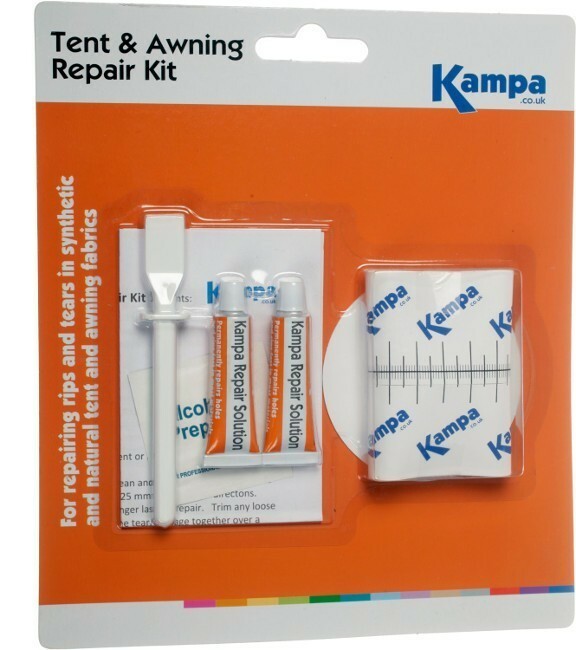 Repair kit including self-adhesive-repair tape and repair solution for fixing rips, tears and holes in tents and awnings with both natural and synthetic fabrics. Kampa Repair Solution will adhere to almost any surface for fast, strong and extremely durable repairs to thousands of items. Ideal for sealing and repairing holes and rips in tents, awnings, inflatable products including tents, boats, toys and airbeds, self inflating mattresses, waterproof clothing, wellingtons, waders, boots and shoes, car hoods, horse rugs, umbrellas, sails, bags, paddling pools, water sports, fishing and hunting gear.